In Slovenia is located cave with deepest vertical underground pitch in the world – Vrtiglavica (Vrtoglavica). 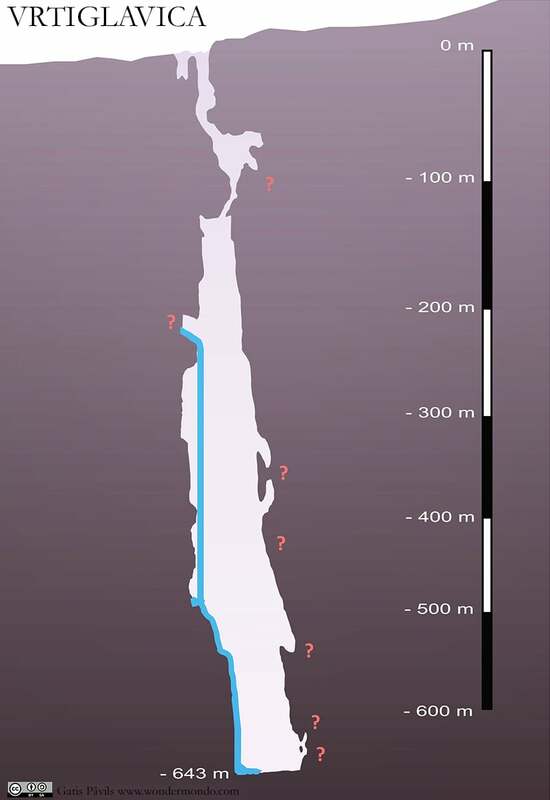 Total depth of cave is 643 m, but uninterrupted free fall here would be 603 m high. The enormous Canin massif in the Alps, on the border of Slovenia and Italia is formed from very thick (almost 1 km) Dachstein (Triassic) limestone layer. This mass of carbonate rock is a perfect example of karst processes. 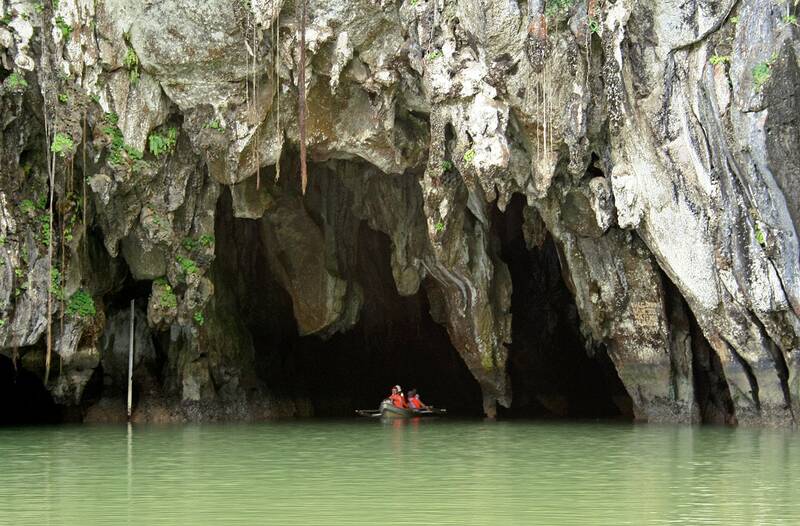 Speleologists have explored hundreds of kilometers of cave passages here, there are known more than 800 caves. Many caves here are very deep and long, the deepest cave here is the 1,533 m deep Čehi 2 cave, several more caves are more than 1 km deep. Especially famous are the vadose pit caves of Canin massif, which basically are extremely deep wells, formed by a vertical flow of rainwater and meltwater through the limestone. Cave with the world’s deepest underground pitch – Vrtiglavica ("cave of vertigo, the cave of dizzyness" in Slovenian) – was discovered in summer 1996 by Italian speleologists. Some months later there was organized a joint Slovenian – Italian expedition, which reached the bottom of this fantastic cave on October 12, 1996. The descent was done by Slovenians Rok Stopar, Matjaz Zetko, Miran Zobec and Italians Massimiliano Palmieri, Louis Torelli, Roberto Spina, Matteo Rivarossi and Luca Tanfoglio. Entrance of Vrtiglavica is located at the height of 1,900 m. The upper part of the cave is adorned with icicles and other ice formations – this is a danger to cavers far below. Upper 50 m of the cave are like a smooth, cylindrical wall, but further down it becomes narrow. At the depth of some 150 m cave becomes wide again – here starts large, half a kilometer deep well. At the depth of some 200 – 240 m from a side passage comes waterfall, which is one of the deepest underground falls in the world – approximately 400 – 440 m high. At some 450 m depth starts tilted descent until the full depth of 643 m.
Bottom of the cave is covered with rubble, the stream disappears among the stones. As the entrance in the cave is narrow – not wider than the main body of the cave, it is assumed that Vrtiglavica formed before the ice period and the upper layer of rock was then removed by ice. 603 m long rope can freely hang inside this cave – thus Vrtoglavica has the deepest vertical underground pitch in the world. Nevertheless this is not the deepest abyss in the world – two sinkholes in China are deeper. Xiaozhai tiankeng is 662 m deep but Dashiwei tiankeng – 613 m deep. VRTIGLAVICA (N.6926 SLO) – Meno seicentoquarantatre metri.. Accessed on March 5, 2013. This small Alpine country is very rich with natural and man made landmarks. 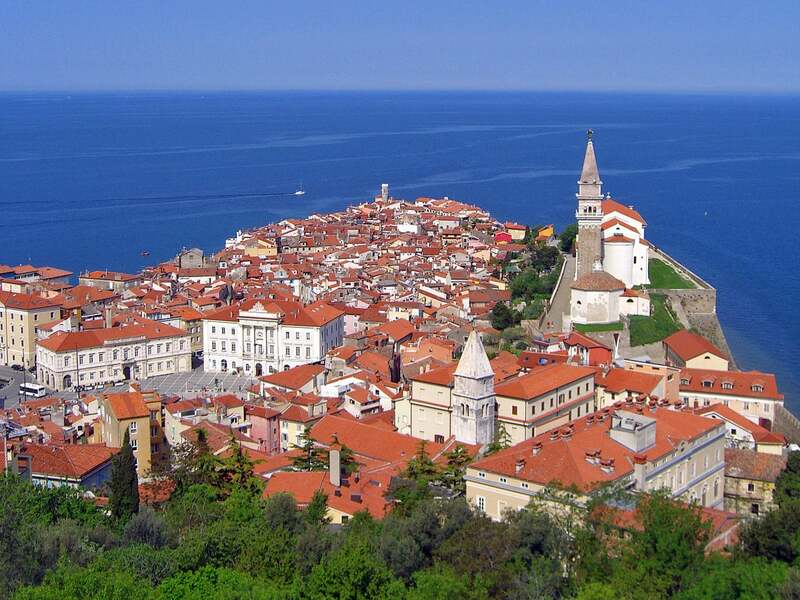 Highlights of Slovenia are its magnificent caves, historical cities and castles, many in Renaissance style. Though, those are known to us offer a surprising diversity of unusual features and impressive sights. This book illustrates the diversity of hypogene speleogenetic processes and void-conduit patterns depending on variations of the geological environments by presenting regional and cave-specific case studies. The cases include both well-known and newly recognized hypogene karst regions and caves of the world. Atlas of the Great Caves of the World is an almanac, encyclopedia, and book of records all under one cover. It is an invaluable reference book for cave explorers and cave enthusiasts of all levels.